There are plans to develop apps tailored specifically to Password Safe version 8. As this project is very time intensive and other issues currently have a higher priority, the synchronisation process will be temporarily carried out using the apps for Password Safe version 7. 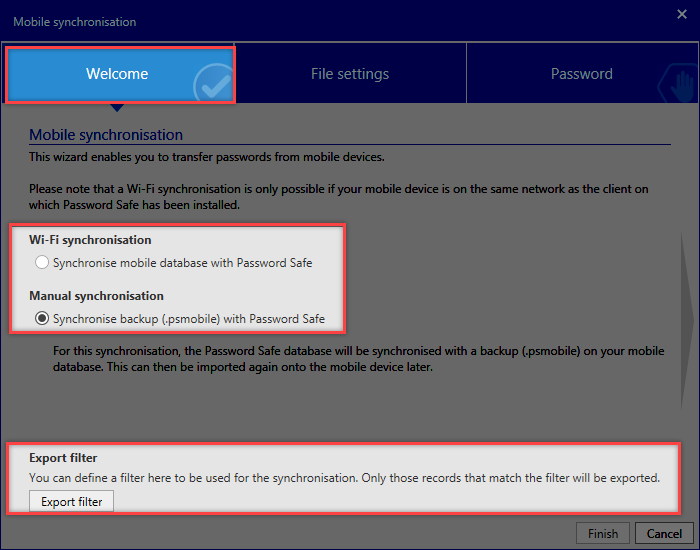 An alternative to the synchronisation process is to use the Password Safe WebClient. This is responsive and can thus be operated on all standard smartphones and tablets. The WebClient connects directly to the database and thus always has access to the latest data. This highlights the biggest disadvantage of the apps. The apps only ever provide access to the status at the time of the synchronisation. If data have been changed since the synchronisation, this will not be available on the mobile device. The WebClient currently has a much larger range of functions than the apps. It is possible, for example, to use sealed or masked passwords. No synchronisation is necessary because the WebClient directly accesses the database. The WebClient requires an active Internet connection to access the data. Ideally, the WebClient and the apps are used together in combination. The WebClient provides permanent access to the latest data, while the data saved on the app can be accessed if there is no Internet connection in an exceptional situation. Apps are currently available for iOS, Android and also Windows Phone devices. They can be directly installed on the mobile device via the Apple App Store, Windows App Store or Google Playstore. The apps are naturally available free of charge. 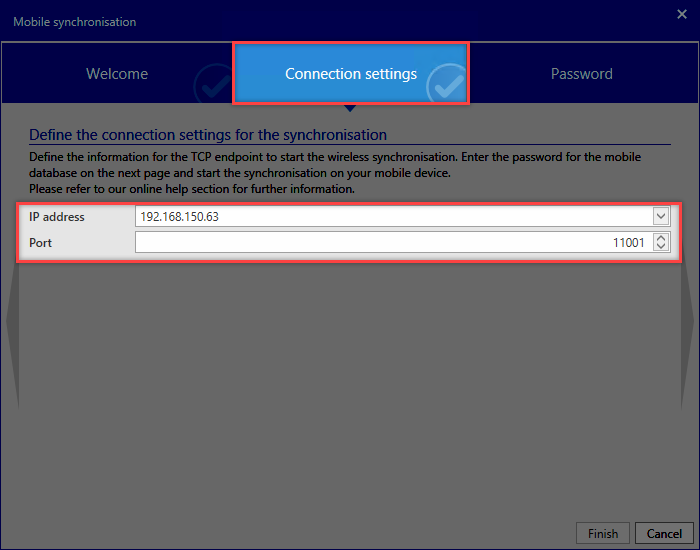 Settings related to the synchronisation are available on both the client and the server. The synchronisation has to be activated for each database on the AdminClient. The corresponding option can be found in the database settings. This setting defines how long the mobile database can be used without synchronisation. Once this period has expired, it is no longer possible to log into the database. In order to protect the data against unauthorized access, it is possible to define the maximum number of failed login attempts before the mobile database is deleted. The general right to synchronise is issued to the user here. This right always allows a synchronisation to be carried out via WiFi. A mobile database needs to be created before the first synchronisation. In addition, it is important to ensure that the required rights have been issued. *All of the screenshots for the client refer to documentation for the version 7 apps. Therefore, they look different to the client in version 8. However, the functionality of the app is either identical or very similar. 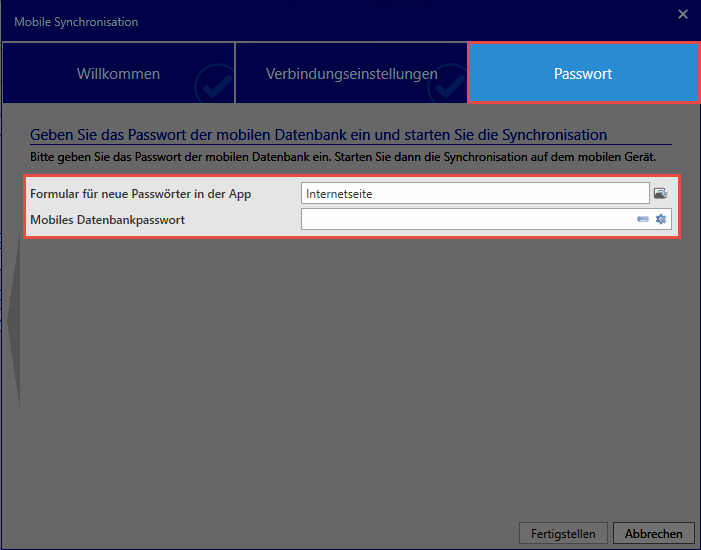 The synchronisation is started in “Backstage” under Account on the Password Safe client. A corresponding wizard guides you through the synchronisation. In the first step of the wizard, you select whether the synchronisation should be completed via WiFi or manually. In addition, the export filter can be used to select which records are synchronised. The second step is used to select the adapter via which the synchronisation is carried out. If manual synchronisation has been chosen, the storage location for the synchronisation file is selected. In the final step, it is possible to define which form can be used to create new records in the app. The password for the mobile database is also entered here.